SORRY- THIS RIDE IS CANCELED DUE TO RAIN. IT WILL BE RESCHEDULED SOON! New to CRW? Looking for a more casual ride or just getting back into cycling? Then this is the ride for you. It's not a beginner's ride-- riders should have road or fitness bikes and be able to average 12-13 mph on the flats. The ride leader will try to keep the group together, but cue sheets can be downloaded and road markings will be available for those who may want or need to do a different pace. The focus is on briefly reviewing how group riding works, staying safe, and most of all, having fun. Feel free to text or email the ride leader with questions. 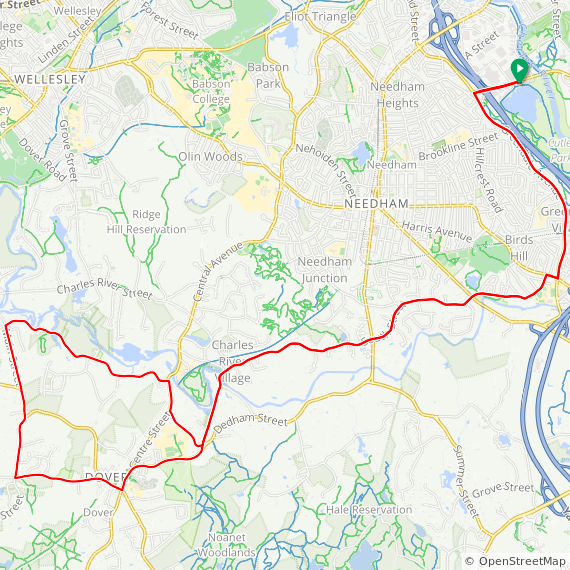 Ride along the scenic Charles River on rolling roads through Needham and Dover. If coming from the south you can exit RT 95 at the Kendrick Street exit and take a right at the top of the ramp.